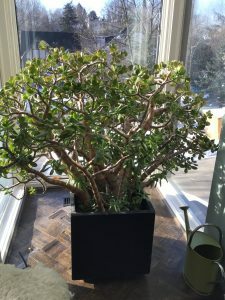 I have to repot my huge jade plant, can you give me some tips? Current pot is 14 inches, should I go to a 16 inch pot or larger? What kind of soil should I use? What a beautiful jade plant! Jade plants should be repotted only when root content reaches about 80% of the pot volume. When this is the case, the next larger size pot (e.g. usually 2 inches wider, as you’ve suggested in your question) should be selected. Plants like cacti and succulents want to have their soil dry considerably between waterings. Therefore, be sure you do not place them in too large a pot. In general, placing plants with a small root ball in a large pot can result in root rot because the soil may stay very wet for a while. Also, make sure your pot has drainage holes at the bottom. Any indoor soil, however, in time will become depleted of nutrients and develop a build-up of salts. Therefore, it is recommended that you replace the soil in houseplants by repotting. Flush the salts out of the soil with water at least once or twice a year. You may also want to consider covering the soil surface with a layer of sand or gravel.